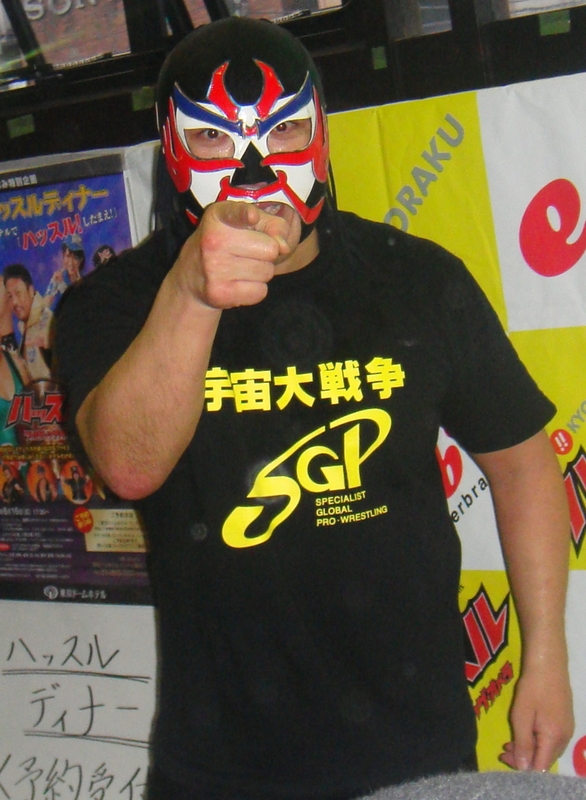 Yesterday in voice class I had some success with the topic of “The Great Sasuke”. Masanori Murakawa, aka The Great Sasuke, was a Japanese professional wrestler turned politician. Sasuke was elected to the Iwate Prefectural Assembly in 2003, and refused to remove his mask when serving in office. In fact, he rarely (if ever) removes his mask in public at all. I got the students to discuss if they thought it was okay for an elected official to wear a wrestling mask while on the job. From there the students came up with a list of appropriate and inappropriate accessories for a politician, including jeans, sombreros, Elton John glasses, etc. The topic went well and the students got some good practice agreeing and disagreeing. Today I attempted the same topic again with four different students. 3 out of 4 were really enjoying the topic, and the other student started giving answers like “I don’t care”. At one point I asked him a question and he looked directly at me, didn’t say a word, then started playing with his cell phone. I have never had such a strong negative reaction before. Maybe my student was actually Sasuke without the mask? This entry was posted on March 14, 2014, 10:08 am and is filed under Kawasaki Nova, Teaching English. You can follow any responses to this entry through RSS 2.0. You can leave a response, or trackback from your own site.